I had wanted to put the table of contents for a long page in a fixed position in my browser. The following code will put it on the bottom left, such that it will stay there when the page scrolls. You could put anything inside the block, but the TOC is particularly helpful because it can be used for navigation around the large page. I've also added this functionality to this page, so you can see it in action. Since the page is not all that long, you might want to shrink up your browser so you are able to scroll the page. NOTE: I have discovered that this works poorly or not at all in IE. Blame Bill Gates (as I already do for many things). I have also found it very helpful to use this technique to put edit and edit sections buttons always available. So I put the following code in my sidebar page. It is also on this page, not in code, so you should see it on the bottom left. It is on this page. You should see the table of contents for this page on the bottom left. If the page is too short to need to scroll, shrink your browser until it does scroll, so you can see it in action. If you are using a right-hand sidebar and you want this still to appear below the sidebar, just change "LEFT" to be "RIGHT" (but you guessed that, didn't you). I remember my old wiki used to have a feature where, when I opened the editor, a block just like this would appear at the top right corner, with a link to jump down to the editor. It didn't stay in a fixed position, but it looked very similar to this one. The wiki doesn't seem to have this anymore, for some reason… Does anyone know if it is possible to recreate this? An alternative and quite simple way to do this is to set up css columns, one of which simulates the sidebar. Make sure you turn off your side bar in your site manager. 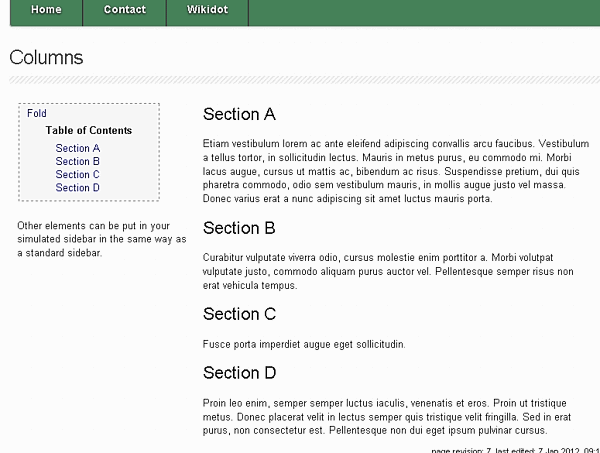 Then on your page or in your live template create a css module to specify the width etc of the columns. Other elements can be put in your simulated sidebar in the same way as a standard sidebar. Etiam vestibulum lorem ac ante eleifend adipiscing convallis arcu faucibus. Vestibulum a tellus tortor, in sollicitudin lectus. Mauris in metus purus, eu commodo mi. Morbi lacus augue, cursus ut mattis ac, bibendum ac risus. Suspendisse pretium, dui quis pharetra commodo, odio sem vestibulum mauris, in mollis augue justo vel massa. Donec varius erat a nunc adipiscing sit amet luctus mauris porta. Curabitur vulputate viverra odio, cursus molestie enim porttitor a. Morbi volutpat vulputate justo, commodo aliquam purus auctor vel. Pellentesque semper risus non erat vehicula tempus. Fusce porta imperdiet augue eget sollicitudin. Proin leo enim, semper semper luctus iaculis, venenatis et eros. Proin ut tristique metus. Donec placerat velit in lectus semper quis tristique velit fringilla. Sed in erat purus, non consectetur est. Pellentesque non dui eget ipsum pulvinar cursus. You'll have to put that in your actual page rather than in the sidebar page. It will get the toc from the page it is on. Hi, I'm trying to build off of this to try and get my side-bar to automatically populate a TOC for the page - but I've come up with a flaw. While it will properly update the links to jump where it is supposed to… it's pulling the titles from the sidebar page instead of the page it's on! Re: Fixed TOC via SideBar? You have to "build" your side bar inside the page category itself - as a part of the page.. Sorry, for my long answer with the second by yourself build "side bar" menu..
if your pages are in the category "car:" than the _template would name "car:_template" . I have no idea if or how it could be done. This snippet is more about putting a fixed block on a page, and I suggested the toc just as an example that you might want to put in it. That's about the limit of what I know about toc's. sorry. Have a look on the snippet: http://snippets.wikidot.com/code:tocs ! No, it won't be #toc5 for the 5th title, it will be #toc5 for the 6th title, since the first one has value #toc0…. Thanks, Brunhilda, I have forgotten this…. Any way to have a TOC from another page? Hi, I would like to display TOC's from multiple pages on just one. Is it possible to put fixed edit buttons in the top bar? I use pages without side bar…. try using the fixed position dic in a permanent page like nav:top ! Thanks to RJScar, who put this comment in the thread in which I had originally asked for this solution. Thanks a lot, I'd been trying to do that for a long time! If the TOC is so long it gets out of the page, you can add "overflow: scroll" in the style definition.